People respect, value and admire their superiors at the workplace only if they know the exact makings of a great leader. As more and more women are being promoted into leadership roles in the corporate world, their male counterparts are yet to value the leadership traits that they tend to possess. When faced with a challenge, women usually look for an opportunity that lies within. They move ahead when faced with tough situations and learn what they can from such challenges. They have an optimistic mindset since they believe that there is an opportunity in everything. Men, in contrast, are not always opportunity driven, and this hampers their growth. For example, Estée Lauder, born to Hungarian immigrants was an opportunist in the cosmetics industry. When the cosmetics industry experienced a boom in the postwar period, women wanted to sample cosmetic products before they bought them. Lauder noticed this trend and pioneered two marketing techniques that are used even today-free gifts and gift with purchase. Thus, it is inventiveness which often enables women to pursue the opportunities that they face in the corporate world. ‘Aggressive’ is a common word which is often used in the negative sense for women in the business world. But have an aggressive approach towards work is vital for long-term success. A woman who is aggressive isn’t necessarily someone who shouts and yells at subordinates or dominates them every now and then. Such a leader rather has the necessary aggression to move projects on. The approach that they have towards work is that of constructive aggression. They lead their team by example and are good at motivating their subordinates with their high level of dedication. But for a lady who has an aggressive approach towards work, it is essential to create a high level of trust among team members. Ladies who are cooperative with their staff are able to bring out the best effort out of their team and ensure that long-term business goals are achieved. Women tend to see things that others most often tend to overlook. Therefore, they can look well beyond the obvious details which are presented to them by their co-workers. They love to stretch views and broaden their observations. There are situations when they play a major role in testing the intentions of others and assure their managers that their viewpoints are reliable and trustworthy. Women who are successful in the corporate world have a high ability to anticipate things that are unexpected. They know what steps they should take and can make calculations of the time each of their moves will take. They do not let their egos stand out in the way of doing business and can, therefore, get along with people whose viewpoints may not match with that of their own. Women have a better ability to listen to and understand what others may feel as compared to men. Employees, men as well as women are human beings and have their own share of frailties, weaknesses, and insecurities which need to be expressed. All individuals have their own share of problems and worries which need to be addressed with care and treated with tenderness. But what sets successful women apart is their understanding of such a situation, without being sentimental. Therefore, they are likely to be more cooperative and understanding as a manager as compared to their male counterparts. Thus, women can win the confidence of their subordinates. They can thus find it easy to win the respect and trust of their team as compared to males. Women who hold a leadership position in big organizations and are well-known in the corporate world are known for their high energy levels. To enhance the level of enthusiasm of their team and ensure that their energy is channelized in the right direction, they need to ensure that they do not feel overburdened by their load of work. There, they need to ensure that they have good food, breaks in between work and workout sessions on a daily basis. People tend to hate working under someone who complains every now and then about the long hours that they have to work for. Dealing with such a person on a day to day basis may cause a lot of irritation. Therefore, they should plan their routine in such a manner that they do not feel exhausted. 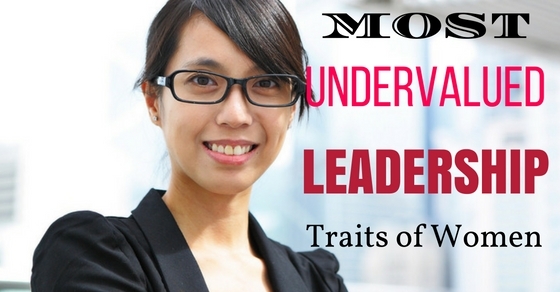 Down the ages, women have been regarded and stereotyped as emotional leaders by men. However, there are ample examples that they are passionate in their pursuit of perfection. When they feel unsatisfied with the status quo, they will strive to make things better. They try to get important things which need to be addressed done at the right time and ensure that there is no unnecessary delay. They prefer order and stability and have a genuine sense of control. As they have progressed up the corporate ladder, many women are not dependent on others and are therefore more independent in their working style as compared to men. It is their own way of showing their focus towards their work. When they run short of ideas at what they are searching for, they tend to drift away. Their high level of passion makes them the valuable assets for their companies. Women in the leadership positions within companies are likely to stress out because of their irregular hours of work. As the work pressure tends to increase with every passing day, they tend to work out their daily schedule in a planned organized manner. Sometimes, taking refreshments at a specific time of the day, or a deeply relaxing bath can work wonders to rejuvenate oneself. Maintaining focus on the day to day work is, therefore, a major challenge that women in high-ranking positions may face. A morning walk on a daily basis can help them get the necessary relaxation and plan their day’s schedule beforehand. This can make sure that they do not feel stressed out because of the long hours that they have to devote to the office. Many women who are in leadership positions are highly enterprising and resourceful. They are proficient in spotting opportunities and are experts in creating relationships that are essential to get a work done. Quite a few of them can foresee the growth amenities that are available to them and strive hard to achieve them. They are well aware that in order to create and maintain momentum, they need to be completely focused on their objective. Therefore, they make sure that there are no distractions to their work. They find a lot of excitement and motivation from the day to day work that they do. They are highly creative when handling their duties and responsibilities. They can keep a track of the progress in projects because they know that distractions can cause things to go haywire. They are therefore highly focused on the objectives that they want to achieve. Women leaders tend to inspire others to achieve and perform to the best of their abilities. They are well aware that they are likely to be underdogs within a company and try their very best to perform maximum to achieve their goal. They follow high standards of professionalism. They pay attention to details which make it tough for staff members to abuse any type of special privileges. They are nurturers by nature and tend to be good listeners and have good networking skills. Women are good at creating a collaborative style of working which allows everybody to come up with their own thoughts and ideas. Thus, they help in accelerating the speed of execution. They thus play a major role in building a cooperative work environment within the company. Be it at the workplace or anywhere else, women play a major role in keeping things running smoothly. When they find that tensions between individuals are growing which may ruin the office atmosphere, they step in and take control of the situation. They won’t allow things to go out of hand. They provide leadership at the office and ensure that the legacy of the company is kept intact. Women who have been highly successful in the corporate world are firm believers in team building. They, therefore, enforce the mission, objectives, and values when they are incharge. This ensures that there is a sense of continuity. It is because of this reason that there are a large number of women who are in management and leadership roles in family owned businesses across all parts of the world.